To ensure fume hood longevity, the interior liner material must be compatible with the chemicals they are exposed to. Hood liner materials are subject to attack from acid fumes and solvent vapors by corrosion (the destruction of metal or other materials by chemical or electrochemical action), dissolution (a dissolving action to which coatings and plastics are subject), and melting (plastic deformation caused by elevated operating temperatures). Below is a description of the most common liner types, usual applications, and the Labconco hoods in which they are found. Epoxy coated steel liners are typically used in non-corrosive, or moderately corrosive environments. Special care must be taken not to damage the coating as acids will quickly corrode the carbon steel if exposed. This type of liner is very good for heat resistance and is very economical. 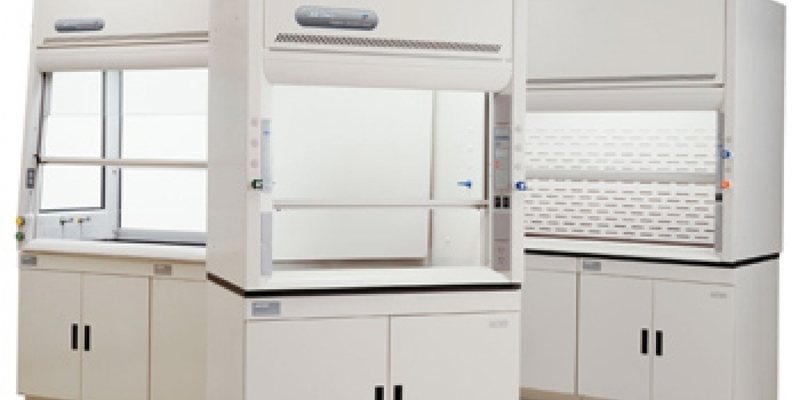 The Labconco Basic™ Fume Hoods are equipped with epoxy coated steel liners. Type 304 stainless steel liners are often seen in applications involving work with radioisotopes. The liners typically include a stainless steel work surface and the corners and seams are welded and ground to ANSI/AWS standards B1.11-2000, D1.6-99, and A5.12. This material and method of construction is typically suitable for this application because it is generally resistant to corrosion, sturdy enough to support the weight of lead shielding, easy to decontaminate and can be static dissipative. Type 304 stainless steel has excellent moisture and heat resistance, good resistance to a wide range of chemicals, but is not compatible with some inorganic acids and metal scavengers. The Protector® Stainless Steel Radioisotope Laboratory Hoods feature a 304 stainless steel liner. 316 Stainless Steel Type 316 stainless steel liners are typically for perchloric acid applications when coupled with a wash-down system. This molybdenum-bearing grade of stainless steel gives Grade 316 better overall corrosion resistant properties than Grade 304, particularly higher resistance to crevice corrosion and pitting. Type 316 stainless steel fume hood liners typically include a stainless steel work surface and the corners and seams are welded and ground to ANSI/AWS standards B1.11-2000, D1.6-99, and A5.12. Like 304 stainless steel, 316 Grade has excellent moisture and heat resistance, good resistance to a wide range of chemicals, but is not compatible with some inorganic acids and metal scavengers. Protector® Stainless Steel Perchloric Acid Laboratory Hoods feature a 304 stainless steel liner. Polyvinylchloride (PVC) PVC is one of the most chemical resistant materials used as a fume hood liner. Typical applications involve acid digestions with chemicals like perchloric, hydrofluoric, sulfuric, and nitric acids. This type of fume hood is typically coupled with a wash down system. Materials of construction for sash glass will vary depending on the frequency of use of these acids. Perchloric is not compatible with the organic polycarbonate, and hydrofluoric is not compatible with the more commonly used safety glass. PVC has a working temperature of around 140Ëš F, and will distort near 160Ëš F. For fume hoods equipped with this type of liner, check out the Protector® PVC Perchloric Acid & Acid Digestion Laboratory Hoods. Fiberglass reinforced composite panel liners are the most common type of fume hood liner. These composite panels have overall superb chemical resistance, working temperature, moisture resistance and flame spread rating. This is a relatively inexpensive liner material and, because it is panelized, offered on a wide range of fume hood models. To see hoods equipped with this type of liner, see the Protector® XL™, XLE™, and XStream® Laboratory Hoods. Fiberglass reinforced composite panels are not compatible with perchloric acid, and should not be used for acid digestions with highly corrosive acids at elevated temperatures. Molded FRP is the most versatile liner material available. Panelized liners tend to show their first signs of deterioration at the seams and joints. This is eliminated by using a mold and forming the liner as a single piece. The sides, rear, roof and duct collar are one continuous piece. This makes typical trouble areas easy to decontaminate, and eliminates the collection of corrosives at the seams. Additionally, one-piece FRP liners have superior chemical and heat resistance, even over Labconco panelized lined hoods. For a fume hood featuring a molded FRP liner, see the Labconco Protector® Premier® line of fume hoods. FRP is not compatible with perchloric acid, and should not be used for acid digestions with highly corrosive acids at elevated temperatures. The first step in determining the appropriate materials of construction for your fume hoods, is to divide the chemical usage by application and then divide the application further based on available material compatibility. Occasionally, some concessions need to be made (typically FRP has the most diverse compatibility) to ensure the most overall resistance to deterioration and highest level of safety. For a table on common liner materials and their characteristics, please reference How To Select The Right Laboratory Hood System, an Industry Service Publication. For general purpose liner requirements, please review Fume Hood Liner Requirements.